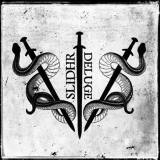 It was something of a surprise to actually listen to Slidhr’s debut album Deluge, after seeing the artwork for with its distinct white background and coiled serpents and swords. After all, as with Norwegians Nidingr’s Greatest of Deceivers album with its own snake obsession, you’d expect a similarly progressive form of black metal to be unleashed. Irish/Icelandic duo Slidhr are quite a distinct unit, however, closer to a more traditional form of black metal than Nidingr’s Dødheimsgard-ian grooves, although still leftfield and unusual compared to the usual black metal output. Atmospheric, subtly dissonant, and willing to throw off genre boundaries as necessary, Slidhr’s strength lies mainly in the execution of the ten songs that make up this album. It’s orthodox black metal, but original – drums are varied and often more than mere texture, the bass is clearly audible, and the tempos shift often. Taking all of these into account means that Deluge can sometimes sound more progressive and different than it actually is; which isn’t a bad thing, the solid black metal core sounding even fresher as a result. Take Hex for example, an ominous bass-led intro leading into blastbeats before the guitars even arrive, high-pitched clean vocals a deceptive leftfield touch in a track otherwise focused on a pounding spiral downwards. That the bass leads the guitars at moments only intensifies the darkness of the march, strangely and subtly catchy, and no less black metal for it. The approach is continued on the following Earth’s Mouth Opens, a touch of Enslaved in the careful and almost melodic pounding underminded by the vocals, miserable and despairing, providing the chaos that the music itself so deliberately lacks. Vocalist (and guitarist and bassist) Joseph Deegan deserves especial praise for his effective performance thoughout, spewing forth Funeral Mist-esque snarls and moans. He’s often somewhat buried by the mix, which puts the rhythm section slightly in front of the vocals and guitars, but always makes his presence known and appreciated. He seems to grow madder as the album continues, the music similarly speeding up with Rejoin the Dirt’s higher-tempo gallop, a track that still slows down to allow the bass sound to be effective. Death of the Second Sun moves from cascading chaos to become lighter aurally if not atmospherically, even throwing some spoken lyrics in, and album closer Rays Like Blades speeds things up again, moving the focus towards the guitars fully and turning almost fully doom at the end, leaving little hint of what direction future Slidhr albums might take. It’s difficult to praise Deluge wholeheartedly. On initial listens you’ll find it hard to distinguish between songs, especially towards the end of the album. The bassy poundings sound quite similar, even if the songs themselves vary more, and the bleak tone that holds everything together can make finishing the album seem like something of a slog. Yet the quality is undeniable, the experience as a whole intense and crushing; Slidhr are definitely worth your time.